City Council members and other officials called Wednesday on Mayor Bill de Blasio to add Hudson River service into his new ferry plan that launches in 2017. The mayor’s Citywide Ferry Service proposal would add five ferry lines to the city’s transit network, but none use the Hudson River. Officials want a Hudson River service that connects neighborhoods in the city, and could also be expanded to New Jersey down the road if there is significant demand. The new planned routes include connections between Astoria and Roosevelt Island with East Midtown and Wall Street, southern Brooklyn neighborhoods like Bay Ridge and Sunset Park with Wall Street, and the Rockaways near Beach 108th Street with Wall Street. The South Brooklyn, Astoria, and Rockaway lines will open in 2017, with boat fares costing the price of a subway trip, at $2.75. Officials and groups that back the plan include Councilman Mark Levine, whose district includes Morningside Heights and Harlem, Manhattan Borough President Gale Brewer, and the Waterfront Alliance. They say crowded subway service on the West Side and new construction like the massive Hudson Yard development show ferry service is needed. The Mayor’s Office did not immediately comment on the idea. Existing ferry service on the Hudson River is currently private. NY Waterway has many commuter routes between Manhattan and New Jersey, connecting towns and cities like Weehawken and Hoboken. The Liberty Landing Ferry Service also runs regularly between Jersey City and the World Financial Center Terminal. Looking for a unique way to experience the splendor of Upstate New York's fall foliage? We've got the perfect answer with the return of the Great Dome car to the Adirondack service for a six-week run during the heart of leaf peeping season! If you're in the region between Sept. 25 and Nov. 4 or just an avid leaf peeper looking for an adventure, you should book your tickets now. The Great Dome is the only car of its kind in the entire Amtrak fleet. The awesome car features an upper level with windows on all sides (and the roof!) to provide you panoramic views of the autumn landscape, breathtaking glimpses of the Hudson River and Lake Champlain and views of the Adirondack Mountains between Albany and Montreal. Seriously, is there anything on Earth that sounds more relaxing? Now for the insider info: There is no additional charge for riding the Adirondack service during this period and seating in the Great Dome car is unreserved. To book tickets for the train, simply use the "Buy Tickets" box to the right of this post. You can take advantage of the I Love NY 15 percent discount off the regular (full) adult rail fare, valid for sale through May 2015. Advance reservations are required. In addition, up to 2 children ages 2-12 may accompany each adult at half the discounted rail fare. The autumn run of the Great Dome car is the perfect opportunity from some #nofilter Instagramming. So be sure to tag your pics #Amtrak to join the conversation! Amtrak's 104-year old Hudson River tunnels are running on borrowed time and need to be shut down for a year each to repair the damage received from Hurricane Sandy flooding, according to transit officials. To avoid any commuting nightmares during these major repairs, Amtrak officials say two new "Gateway" tunnels must be built. Both Hudson River tunnels and two tunnels under the East River sustained enormous amounts of damage, from Sandy driven flooding, which would require substantial repairs to concrete bench walls, track and other infrastructure, Anthony Coscia, chairman of Amtrak's board of directors said during a discussion of a consultant's report about tunnel conditions on Wednesday. The report is the first detailed look at the extent of damage to the Hudson and East river tunnels. "The shell of the tunnel...is in sound, safe condition. We wouldn't run a single train if the tunnels weren't safe," Coscia said. "It is time to advance the (Gateway Tunnel) program now. There is no comfort zone to say we don't need to be worried." Corrosion from the sulfates and chloride left behind, after sea water was pumped out, is deteriorating concrete bench walls along side the tracks, the electrical wiring inside them and the tracks themselves, said Stephen Gardner, vice president of Northeast Corridor Infrastructure and Investment Development. "Over time, something won't function and we won't be able to run a train through them," Coscia said. Amtrak proposed the Gateway Tunnel project, in February 2011, which includes building two new Hudson River tunnels to Penn station, four tracks through the New Jersey Meadowlands, replacement of the trouble prone 100-year-old Portal Bridge and construction of a New York Penn Station south to handle additional passengers. Amtrak officials declined to give an exact price tag, only saying it would range in the multiple billions of dollars. Gateway was proposed after Gov. Chris Christie canceled the "Access to the Region's Core" tunnel project in October 2010 due to concerns about cost increases. Losing one of the current tunnels would be a commuting nightmare, but getting financial support for Gateway will be be difficult, said Len Resto, New Jersey Association of Railroad Passengers president. "The situation gets more dire day by day," Resto said. "You will get delays unacceptable to the riding public and it will become an economic factor. There's only so much that employers will put up with if people can't get to work on time." It is time to advance the (Gateway Tunnel) program now. There is no comfort zone to say we don't need to be worried, Anthony Coscia, Amtrak. A report by consultant HTNB about the tunnel conditions has been shared with the Congressional delegation of both states. "Riders have to tell their Congress people that this has to be fast tracked," Resto said. The report found that salt will continue to deteriorate infrastructure in the old tunnels, which will make train service more prone to delays. On Aug. 19, a piece of bench wall fell on to the tracks, requiring emergency repairs and causing delays. HTNB warned similar incidents are likely as corrosion continues. To do the major repair work, one tube of the two Hudson River tunnels would have to be shut down for a year, which would have severe impact on the 450 trains a day which use the tunnels. Coscia said that can only happen if the Gateway Tunnel project is built first, which would allow Amtrak to take one of the old tunnels out of service without reducing the number of trains it and NJ Transit run. "The tunnels are so busy, our ability to stop traffic (for repairs) is limited," Coscia said. "A new tunnel would allow us to shift traffic." Transit advocates said the tunnels should be built before any other part of the Gateway project. "When Amtrak says tunnels are so important, that's what they'll build first and they won't push for Penn Station South, when they give up on that for the time being, they will have a lot more credibility," said David Peter Alan, chairman of the Lackawanna Commuter Coalition. Coscia would not commit to building tunnels first. "It's not responsible to say we'll create one (Gateway) component without the rest," he said. Until a new tunnel is built, interim repairs call for pressure washing the tunnel to remove salt, removing damaged and loose concrete, coating exposed steel, sealing all cracks and pressure washing and patching holes in the concrete tunnel lining more than one inch deep. The $689 million major repair project requiring a tunnel shut down, would replace and rebuild tunnel bench walls, tracks and roadbed. That price tag doesn't include replacing electrical and mechanical systems inside the tunnels. That work can't be done a few hours during the overnight or during weekends, which is when tunnel maintenance and repairs currently are done, Gardner said. Amtrak officials are looking to insurance money to fund all or most of that work, Gardner said. Work on the two damaged East River tunnels, used by the Long Island Rail Road and by NJ Transit trains which are stored in the Sunnyside Yard in Queens, will be the first major repair project. Three tunnels will remain open between Manhattan and Queens, with one closed for repairs, Gardner said. Design work is starting for the Hudson River tunnel repairs Environmental and preliminary design work on Gateway also has been funded and has started. Most packages are sold at the Ticket Office or Full-Service Ticket Vending Machines. Some packages are available through the venue. Packages are not available through WebTicket. Please note that the prices shown DO NOT include rail tickets. MTA Metro-North Railroad offers plenty of direct, fast and convenient "train to the game" service for the Yankees' 2011 home games at Yankee Stadium via the Hudson, Harlem and New Haven lines. Frequent Shuttle Service from Grand Central Terminal/Harlem-125th Street Station is also available for all home games. View game day train schedules for home games on our interactive schedules page. Train schedules for Yankees home games from June 27-Sept. 25 are also available in PDF format below. You can also pick up new printed Yankees-E. 153rd Street Game Day Service timetables (effective June 27-Sept. 25) at Grand Central Terminal and outlying ticket offices. For more information about the Yankees-East 153rd Street Station and service, please click here. Information on Free/Paid Game Day Parking at stations. Please note: Backpacks and other containers will not be allowed into Yankee Stadium for all games. Check the Yankees' website for a complete list of prohibited items. The B, D and 4 subway lines all go to Yankee Stadium, but their names have been removed from the trains in the scoreboard segment, the 'Great New York Subway Race,' during games. Yes, the B, D and 4 trains still go to Yankee Stadium. You just wouldn't know it by watching the "Great New York Subway Race" during Yankees games this season. Fans of the scoreboard segment, in which three animated trains race through the city in a season-long battle on the giant scoreboard screen, have noticed the absence of the familiar B, D and 4 markings on the front of the subways, representing the three lines that go to the Stadium. Instead, the trains have been dubbed "Road Gray," "Midnight Blue" and "Pinstripes," leaving many die-hards wondering where the regular trains have gone. According to the Metropolitan Transportation Authority and the Yankees, that could all change soon, once a financial misunderstanding between the MTA and the Yankees is cleared up. While some assumed that the MTA had ordered the Yankees to cease the use of the names, a spokesman from the authority told the Daily News that couldn't be further from the truth. "We considered the video subway race to be a great method of promoting taking mass transit to games," MTA spokesman Kevin Ortiz said. "We're disappointed that the Yankees decided to change the look of the trains." The decision to pull the labels off the trains was the Yankees' alone, although it sounds as if the MTA would be thrilled to see them return to the Stadium's massive scoreboard. According to an MTA official, the MTA had lent the use of its train names to the Stadium feature for years at no cost to the Yankees, the only stipulation being that the segment not be sponsored by another company. When the Yankees brought on Subway Restaurants as the sponsor of the game, the MTA contacted the team to discuss a potential change to their arrangement. The Yankees, presumably believing the MTA was looking for a piece of the sponsorship pie, never returned the call, opting instead to drop the names of the train lines in favor of the team-related colors. "They assumed erroneously that we were looking to cash in on their sponsorship," said an MTA official. "We weren't." The MTA planned to propose a cost-free alternative, asking for a tag line at the end of the segment reading, "The Yankees and the MTA urge fans to take the train to Yankee Stadium." Informed of the MTA's stance Tuesday, the Yankees said they were open and receptive to finding common ground with the MTA, paving the way for a quick resolution that would return the B, D and 4 trains to their rightful place on the Stadium scoreboard. "The Great New York Subway Race has been an identifiable fixture at Yankee Stadium for years," said Jason Zillo, the Yankees' director of media relations. "I take the 4 train to work every day - and it's much faster than the B and D."
That's music to the MTA's ears. "It would be a win-win for everybody involved to get the numbers and letters of these three subway lines back on the trains," the MTA official said. "Hopefully it will happen." Zhu Yi used to nap on the five-hour train ride home to Wuhanfrom Zhuzhou in central China. Now that a fast rail line has cut the trip to an hour and 40 minutes, he can spend more time selling information-management systems. The view from Zhu’s reclining seat shows how China’s push to build a 16,000-kilometer high-speed passenger network by 2020 is carrying China’s industrial boom inland. All along the trackside are earth movers and excavators clearing land and beginning construction. They merge into a blur as the express accelerates to 350 kilometers (218 miles) an hour. The country’s planned 2 trillion yuan ($300 billion) in spending will give it almost as much track by 2012 as the entire rest of the world, even before the network is completed. The new trains will transform China’s economy in the way bullet trains did in Japan in the 1960s and 1970s, according to Beijing-based China International Capital Corp., the top-ranked brokerage for China research in Asiamoney magazine’s annual survey. “China’s high-speed rail program is altering the landscape of consumer and property markets,” said Jing Ulrich, JPMorgan Chase & Co.’s China equities and commodities head in Hong Kong. China’s bullet-train spending has buoyed rail stocks since a 4-trillion-yuan stimulus was announced in November 2008. Shares of Dalian-based China Railway Tielong Container Logistics Co., which provides railroad, truck and water transportation services, have risen 2.5 times since then. China Railway Erju Co. in Chengdu, which designs and builds railways, has more than doubled. Companies providing rolling stock and equipment to train operators have some of the best growth prospects in the country, said Anderson Chow, a Hong Kong-based analyst with Macquarie Capital Securities. Overall investment in China’s railway industry will total 3.8 trillion yuan from 2011 to 2015, about 50 percent more than in the last five years, he estimates. Earnings growth at CSR Corp., which makes locomotives and wagons, will surge an annual average 38 percent over the next three years, said Chow. At Zhuzhou CSR Times Electric Co. in Zhuzhou, which makes electrical systems for railways, earnings will rise an average of about 35 percent annually over the same period, he said. “If you look around the China market there are very few companies that give you that sort of certainty for earnings growth,” Chow said. The nation’s $90 billion in spending on the network last year far exceeds the $8 billion that President Barack Obama allocated in stimulus for U.S. fast trains earlier this year. Japan’s bullet trains triggered “explosive growth” in tourism-related retail sales along their routes in the decade after Shinkansen services began in 1964, CICC said. Less- developed cities such as Hiroshima, Nagoya and Fukuoka “started to play catch-up in industrial production growth.” Morgan Stanley is selling its 34.3 percent stake in CICC, four people with direct knowledge of the deal said. In China, more businesses will move inland to capitalize on labor as much as 50 percent cheaper than in the more affluent eastern areas of the country, and on lower land and rental costs. Increased rail capacity also will reduce freight bottlenecks, the bank said. Beijing Lanxum’s Zhu said the bullet trains helped him increase sales about 15 percent this year in Zhuzhou, Hunan’s second-biggest city, because he can contact more clients. Changsha, population 6 million and the capital of Hunan province, shows how the fast trains are altering the landscape in central China. He Chuan Road features an array of dusty shops selling tires, noodles and groceries, typical of many provincial cities. Just around the corner towers the 200,000-square meter Changsha South Railway Station, its glass curtain walls capped by a 38-meter-high waved roof. The coming of the trains prompted CITIC Capital’s Stanley Ching to bet 1.5 billion yuan on CITIC’s purchase of the ID Mall shopping complex in the city center, about 30 minutes from the station. He plans to add a chain of branded retail malls over the next three to five years, mostly in second- and third-tier cities along the high-speed rail routes. China’s industrial transformation may be greater than Japan’s because its rail network will be bigger and its trains faster, according to JP Morgan’s Ulrich. The China-made CRH380A train set a new domestic train speed record of 416.6 kilometers per hour during a trial run in September, according to state-run Xinhua News. “Places west of Shanghai can become part of China’s giant east coast export zone, and that’s already starting to happen,” said Arthur Kroeber, managing director of Beijing-based Dragonomics, an economic advisory firm whose clients include Fortune 500 companies and hedge funds. China has more than 7,000 kilometers of high-speed track so far. By 2012, Beijing plans to have 42 lines in operation, covering 13,000 kilometers. Within a decade all provincial capitals and cities with more than 500,000 citizens will have high-speed links, the Ministry of Railways says. Already, the Chinese rail system is larger than any other country’s, according to the Paris-basedInternational Union of Railways. Changsha’s fast rail link enables CITIC Capital to hire senior staff from coastal cities such asShenzhen to manage the retail malls, said Ching. When the Guangzhou-Shenzhen line opens next year, travel time to Changsha will shrink to about 2.5 hours from more than 9 hours. Another line, scheduled for completion in 2014, will cut travel time between Guangzhou and Yunfu, a city of 2.6 million in Guangdong province, to 40 minutes from more than 2 hours. Companies based in Yunfu, such as stainless-steel tableware maker Linkfair Group and agricultural company Wen’s Group, will benefit, said John Scales, Beijing-based transport sector coordinator at the World Bank. The link will help them recruit designers and research staff, according to a World Bank case study on the city to be published next year, said Scales. China’s development of locomotives has won its companies overseas orders in Argentina, Saudi Arabia and Venezuela, and the nation is competing to build a high-speed railway in California costing more than $40 billion. CSR Corp. and China CNR Corp., both based in Beijing, signed overseas contracts worth a combined $2.3 billion last year, according to their annual reports. The sales included switches to the U.S. and 20 locomotives to New Zealand. In Brazil, Beijing-based China Railway Construction Corp. and China CNR are leading a group bidding for a line that may cost as much as 33.1 billion reais ($19.2 billion). The overseas expansion has brought new risks to the sector’s stocks. Shares of China Railway Construction, builder of more than half the nation’s railroads, fell the most in almost two years Oct. 26 after it predicted a 4.15-billion yuan loss from a Mecca, Saudi Arabia rail project. Credit Suisse Group AG that day lowered its stock rating on the company to “underperform” from “outperform.” China Railway Construction reported a 1.36 billion yuan loss for the three months ended September on Oct. 28, compared with a 1.45- billion yuan profit a year earlier. Critics in China, including professors at Peking University and Beijing Jiaotong University, say the network’s high cost makes it financially unviable in a country where the average urban worker made 32,244 yuan last year, less than one-eighth of the $39,054 average wage in the U.S., according to data from the U.S. and Chinese governments. Railroads played a role in the collapse of the U.S. corporate bond market in the late 1800s. The market had grown in prominence on Wall Street as railroad barons looked to raise cash to expand into the American West. Then came a flood of defaults, which prompted lenders to start demanding certain protections, known as covenants, written into bond contracts. The 1870s proved to be “a disastrous decade” as default rates reached 35 percent, according to a Stanford University research paper. Russell Hoss, manager of the Newport Beach, California-based EPH China Fund, said investors in China may do better buying companies with businesses along the new lines. “The best way to play high-speed rail is via branded consumer companies expanding in inland cities that are being linked to the east coast by the new tracks,” he said, declining to name companies. The $90 million fund’s only rail-linked investment is Nanjing-based China High Speed Transmission Equipment Group Co., which raised first-half revenue from its rail power business more than sixfold to 15 billion yuan. Kroeber said construction of new track for the network will free up space on existing lines for freight, generating enough revenue over 15 years to pay for the new lines. China’s rail network is “bursting at the seams,” he said. Freight has doubled between Guangzhou and Wuhan since the route opened in December, said He Huawu, the railway ministry’s chief engineer, in an interview. The separation of passenger and cargo lines will release seven times the capacity for container transportation, according to Shanghai-based Shenyin & Wanguo Securities Co.
Singapore-based DBS Asset Management, which in April set up the China Rail Network Opportunities Fund, sees a long-term expansion. The fund includes shares in such companies as Fuzhou-based department store Fujian Dongbai (Group) Co., Ltd., which Chan expects to record earnings growth of more than 40 percent over the next two to three years, in part driven by greater mobility of labor spurred by high-speed rail links, he said. New York-based Echo Lake Capital owns stock in concrete maker China Advanced Construction Materials Group Inc. because it’s poised to “benefit significantly from China’s high-speed rail construction and infrastructure build-out,” said fund manager Ephraim Fields in e-mailed answers to questions. The Nasdaq-listed company, which supplies more than 50 percent of its concrete to high-speed rail, is also beginning to benefit from development in cities joined by the new lines, said Beijing-based Chairman and Chief Executive Officer Han Xianfu in an interview. It expects to pour 1.5 million cubic meters of concrete for a township near Wuhan spurred by the Guangzhou- Wuhan-Zhengzhou line, said Han. Reinforced metal plates are being installed along the walls of a number of subway tunnels running under New York's Hudson River in a secret project to terror-proof the high-risk travel route. The Port Authority has brought in contractors to ensure the walls of four PATH subway tunnels won't give way and flood the system should a bombing take place on a train. Flood-prevention gates are also being put in place at either end of the two main lines that run from the World Trade Centre and the West Village to Jersey City. 'These are designed to avoid massive, catastrophic flooding, and the Port Authority will have protocols in place to evacuate everyone in the tunnel first,' a source told the New York Post. Workers are apparently installing 15 pieces of inch-thick steel plates each night as they rush to complete the project before the World Trade Center memorial opens next year. 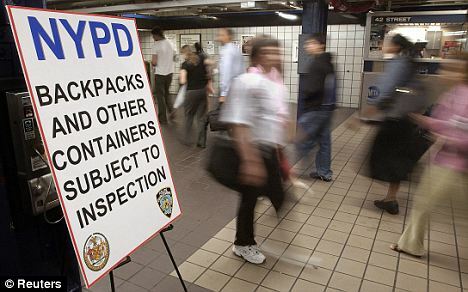 In 2006, law-enforcement officials foiled a terror plot to bomb the PATH system. 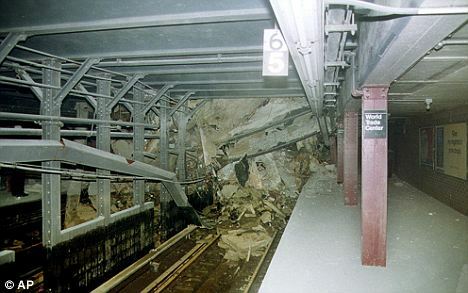 The same year, a terrifying report about the vulnerability of the subway's tunnels to a bomb was leaked to the media. The report said that if a small explosive - with enough power to create a 50-foot hole in the tunnel - were detonated there would be catastrophic results, with more than a million gallons of Hudson River water each minute surging into where the commuters were. The PATH tunnels - which are nearly a century old - are thought to be considerably weaker than other underground subway routes, so are a key target for terrorists wanting to wreak havoc. 'The safety of our customers is the Port Authority's highest priority, which is why we have spent over $5 billion since 9/11 upgrading the security systems at our facilities,' said Ernesto Butcher, the agency's chief operating officer. The short subway in the sky is back. The Roosevelt Island tram reopens today after an eight-month, $25 million overhaul -- a relief for residents who prefer it to the subway or buses. Riders will see 30 percent more windows, more seating space, faster travel times and wider walkways into and out of the pods. "This is the most modern aerial-train system on earth," said Leslie Torres, CEO of the Roosevelt Island Operating Corp., the state agency that owns the tram. The new model (above, yesterday) is designed to last 30 years. The old one made it through about 17. And each of the two cars now has its own cable, so, at rush hour, they can pick up passengers on the same side at the same time, said designer David Aubonnet, of French-based Leitner-Poma. "The old tram was basically a ski lift," he said. The new cable cars are also expected to rock less in windy conditions. Oddly, they'll hold fewer people, down from 125 to 109 -- although the highest number recorded in the old cars was less than 100, Aubonnet said. The 3-minute trip from Manhattan to Roosevelt Island will take a minute less than before. The tram had been expected to reopen on Sept. 1, but bad weather held up test runs, officials said. Commuters at New York City's Penn Station got a big surprise Tuesday as country music star Keith Urban put on a 30-minute “pop-up” show right in the middle of the morning rush. Urban said that as far as venues go, the massive rail station was a fun new place to play. After his NYC show, Urban hopped a train to Philadelphia for another Amtrak audience, and he will also treat 50 fans to an exclusive set on board an Amtrak train back to New York. It is all part of a “Get Closer to Keith” event to celebrate the release of his new album "Get Closer," which hit stores Tuesday. Urban has tried different things to connect with fans, from unique shows to contests, and he said it was his way of giving back. “I like to reciprocate what they do for me too, because it’s all about connecting. If we can make music that they connect with then there’s purpose to everything," he said. On another note, now that Hollywood has taken on country music, with Gwyneth Paltrow singing at the CMA Awards, could Urban’s A-list wife Nicole Kidman be next?